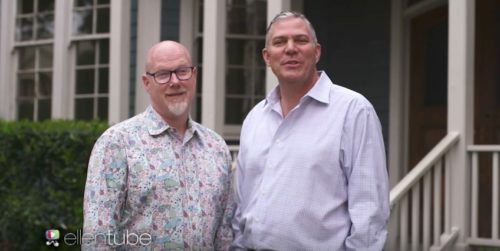 Ellen DeGeneres hosted gay dads Rob and Reece Scheer from Darnestown, Maryland on her show yesterday and the two amazing men nearly brought her to tears. Fair warning: grab your Kleenex because you may not be as strong. The two men have adopted four children with special needs. They were all removed from abusive or neglectful situations and have found a warm and loving home with their new dads. “I don’t know if I was ready for that, but we just made it work. That’s what family’s about, you just make it work. They don’t care that we’re white and we’re gay, they care that we love them. But the duo didn’t stop there. Rob told Ellen about being a foster kid himself and having to put his belongings in a trash bag. When they picked up the children they later adopted, they too came with a garbage bag of belongings. “I remember walking into our home and saying to Reece, ‘This is unbelievable. We’re making them feel like trash by making them put all of their belongings in a trash bag,” Rob told Ellen. So the two set up a charity, Comfort Cases, to provide foster kids with a small duffel bag stuffed full of essentials and reminders that they’re loved. And that’s where Ellen stepped in. You’ll have to watch the video to see what happens next. If you’d like to donate to the couple’s charity, they have set up a GoFundMe account.